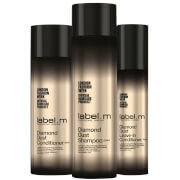 Treat dry, damaged and dull hair to the label.m Exclusive Designer Therapy Rejuvenating Gift Set; a haircare duo housed in a limited edition I-Am-Chen designer gift box. Expertly blended with Moroccan Argan Oil, White Caviar and antioxidant Vitamin E, the regenerating formula nourishes and repairs damaged hair whilst providing anti-ageing properties for a sleek, healthy finish. The brand's advanced Rejuven-8 ™ Complex is combined with Hyaluronic Acid to hydrate, rejuvenate and strengthen without greasy residue. Developed with an exclusive Rejuven-8 ™ Complex, the lightweight, sulphate-free shampoo works to restore, replenish and revitalise hair from root to tip. Expertly cleansing every strand, its effective formula combines eight of the most technically advanced anti-ageing ingredients, including White Caviar, to leave hair strong and healthy-looking after every wash.